This article is a short summary of Super Mario All-Stars Limited Edition. 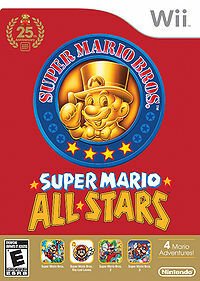 Super Mario All-Stars Limited Edition (released in the PAL region as Super Mario All-Stars - 25th Anniversary Edition and also referred to simply as Super Mario All-Stars) is a re-release of the SNES title Super Mario All-Stars released in 2010 for the Wii. It was released in celebration of the 25th anniversary of Super Mario Bros.. The game was released with a Super Mario History 1985-2010 booklet that tells about Mario's history, and a CD with songs from several games from the series. These extra materials were only available for a limited time after the game's release. The game itself is an unaltered emulation of Super Mario All-Stars. Super Mario All-Stars is back! The Super Nintendo Entertainment System classic is now on the Wii system, featuring four great games and brand-new Wii remote controls! New Wii Remote controls! Hold the Wii Remote sideways, and you're ready to play! 2-Player Battle Mode! Challenge a friend in the Super Mario Bros. 3 Battle Mode, based on the classic Mario Bros. arcade game. This page was last edited on 18 September 2016, at 23:17.